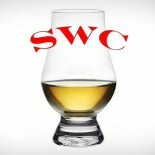 It sure does come in handy that we as a whiskey club are able from time to time to pool our resources well enough to be able to procure hard to find stuff. One such opportunity is when one of our members is able to travel to Europe for work purposes and a perform a quick sashay into a liquor joint. This can be a treat since some distilleries will offer a unique bottling in some select markets, all very far away from stateside liquor stores, bottlings such as Talisker’s Port Ruighe. And I do wish that we didn’t have to go as far as Europe to bag a bottle as nice crafted as this, but alas, such is the whisky life. Nose- Peppery. Salty beach bonfire recently put out. Spice cabinet with leather polish. Marinated meat and grill smoke. Peat oil, wine. Port sweetness with dark chocolate and hazelnut. Taste- Cocoa. Peppery smoke. Dark chocolate. Wine with steak dinner. Viscous and thick. Finish- Lovely peat with hazelnut. Medium length. Repeats of previous notes. Lingering. Sweet cigar. Comment- Boom. Port finished scotches just seem to do it for me. Full flavored and perilously drinkable. Have fun with it. Agree? Disagree? We are ready to believe you.